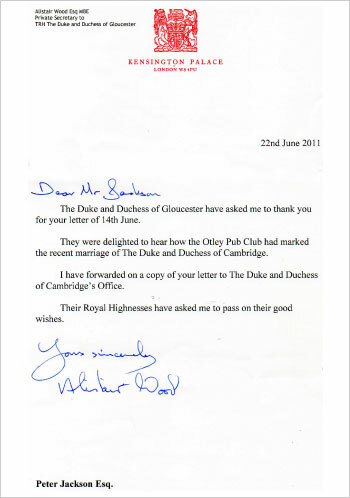 So with this in mind the Otley Pub Club all grouped together with all the local pubs to celebrate the royal wedding by renaming all 17 public houses ‘The Yorkshire Princess’ for the day, due to Kate Middleton’s family connections to Yorkshire. This innovative idea by Greg Mulholland MP was created to protect Otley’s Public houses and promote Otley as a famous Yorkshire pub town. 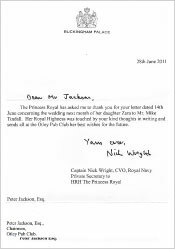 I hope that the renaming of Otley’s pubs to ‘The Yorkshire Princess’ will really get people to notice the fantastic pubs on offer and encourage people to come and visit the town this weekend and raise a toast to the happy couple. I am also delighted to see one of our local breweries getting into the spirit, with WharfeBank, who have recently opened their first pub in Otley, naming a beer ‘The Yorkshire Princess’, in honour of the royal wedding. It should be a fantastic occasion and I hope to see lots of people out celebrating in the pubs of Otley. It should provide a real boost to the town and what better excuse for a celebration than a royal wedding! Otley is a famous Yorkshire pub town, which has laid claim to the title of having the largest number of hostelries per head of population. However, not just here but across the whole country their existence is under threat for various reasons, and Otley Pub Club was set up to give support on a local level by co-ordinating and publicising individual events and larger ones such as this. 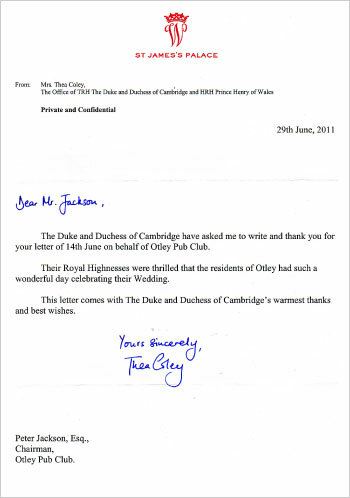 Celebrating the Royal Wedding is a great way if giving a much needed boost to Otley’s pubs and, we think, that by changing their names is a fantastic way of putting the town on the map. 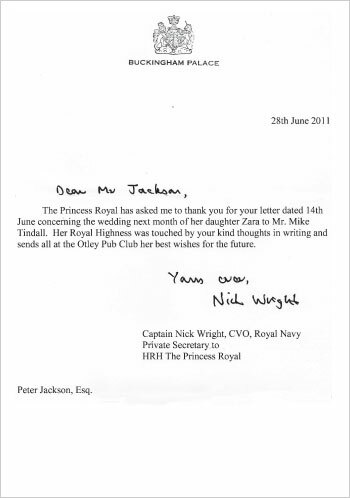 Letters were sent to a number of royal palaces giving news of the events that were carried out, within Otley, to celebrate the wedding of the new royal couple. 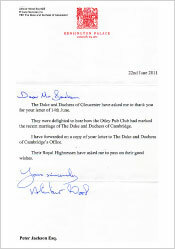 Within a few weeks we received three letters back from Kensingtion Palace, St. James’s Palace and even Buckingham Palace thanking the Otley Pub Club for their best wishes and loyal support to the royal couple. Below are the letters received. Please click on the letters to see an enlarged version.